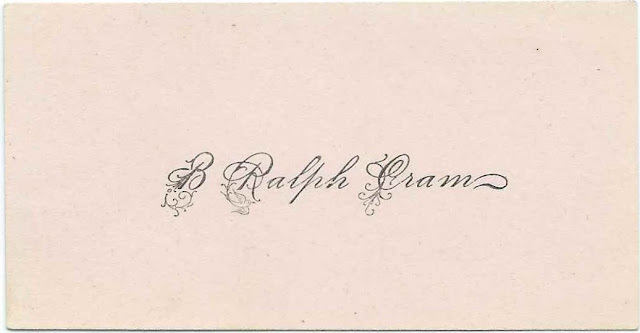 Calling card of Benjamin Ralph Cram of Mount Vernon, Maine. Benjamin Ralph Cram was born November 21, 1869 at Mount Vernon, Maine, the son of Albion Parris Cram and Lora Viola (Walker) Cram. On September 2, 1896 at Haverhill, Massachusetts, Maine, Ralph married Caroline Anna Stevens, a graduate of Smith College and the daughter of James L. Stevens and Delia A. (Hopkins) Stevens. Carrie was born December 26, 1870 at Mount Vernon, Maine. I didn't find a record for children of Ralph Caroline, but I could have missed one or more. Ralph, who graduated from Colby College in 1896, was a grocer in Mount Vernon and served as town clerk and on the school committee. He died in 1941 and Caroline in 1966; they're buried in the Bean Cemetery at Mount Vernon, Maine.